Billionaire investor George Soros has warned that Britain's vote to leave the European Union makes the disintegration of the bloc "practically irreversible". Before Thursday's UK referendum, Mr Soros had warned of financial meltdown if Britain voted to leave. "Britain eventually may or may not be relatively better off than other countries by leaving the EU, but its economy and people stand to suffer significantly in the short- to medium term," he wrote on the Project Syndicate website. Mr Soros made huge profits in 1992's "Black Wednesday" by betting against the British pound as it crashed out of the European Exchange Rate Mechanism. Before Friday's vote he warned of a similar meltdown, predicting a Brexit victory would send the pound down by 15-20%. In the event, sterling fell about 10% to a 31-year low. 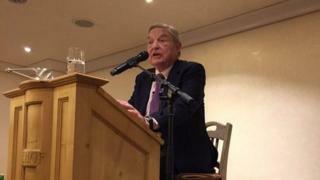 "Now the catastrophic scenario that many feared has materialised, making the disintegration of the EU practically irreversible," wrote Mr Soros in his latest article. "The financial markets worldwide are likely to remain in turmoil as the long, complicated process of political and economic divorce from the EU is negotiated." "After Brexit, all of us who believe in the values and principles that the EU was designed to uphold must band together to save it by thoroughly reconstructing it," he wrote. Can the EU save itself?